Although the steps themselves were visible it was impossible to climb them because of the spiky plants overhanging them, and what lay at the top – even how many terraces are ours – was still something of a mystery. So when we ran into Walter, who we know to be “the man” when it comes to work of this kind, a price was quickly agreed for some basic clearance. 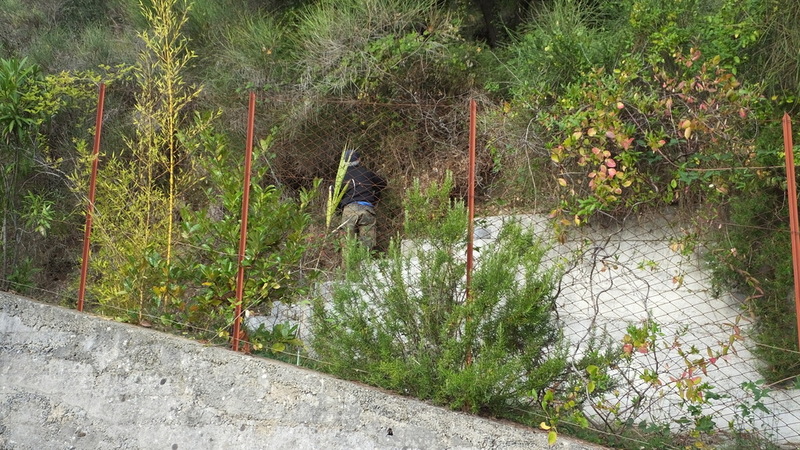 A few days later he arrived with his trusty brushcutter. It’ll take more than just a morning to fully restore this area to its former glory; that’s something I can gradually attack. I just needed a hand to get it started, to at least provide room to have a bonfire on which to throw the debris as I cut it. Jobs like this can only really be done in winter, partly because it’s too hot at other times and also because of the fire risk that prevents bonfires being lit for much of the year. 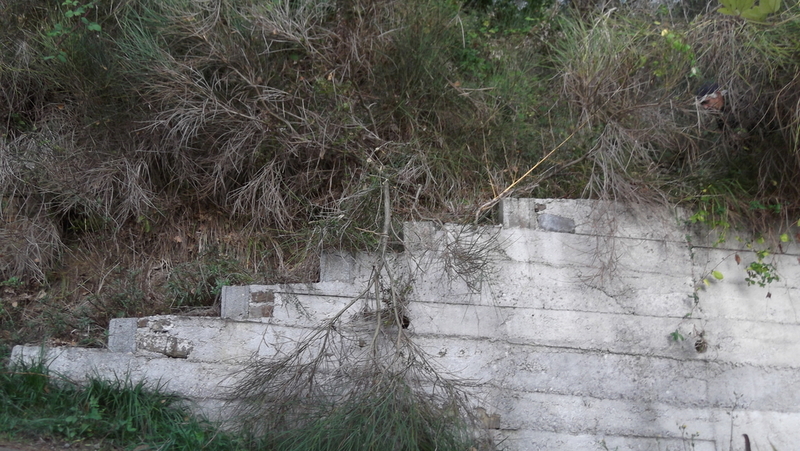 At the end of a morning the steps were now clear of the major overhanging growth; all we need to do is trim the grass. 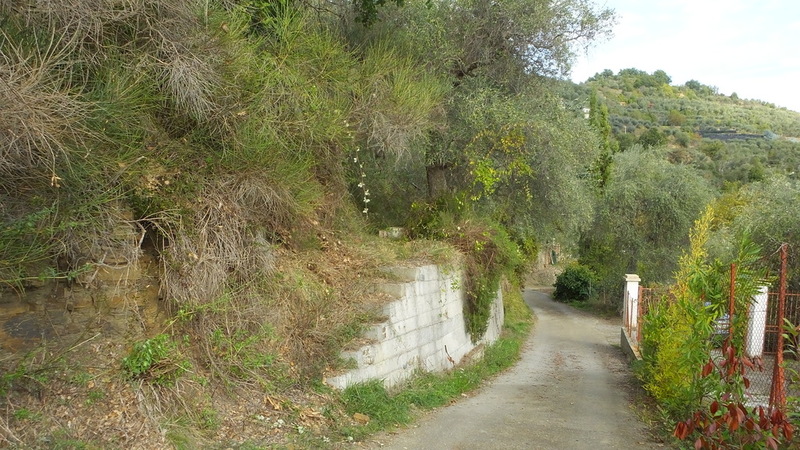 The plan is to deal with the terraces one by one, hopefully in time to collect this year’s good crop of olives. Then the trees will be cut back and stacked as firewood for next winter. 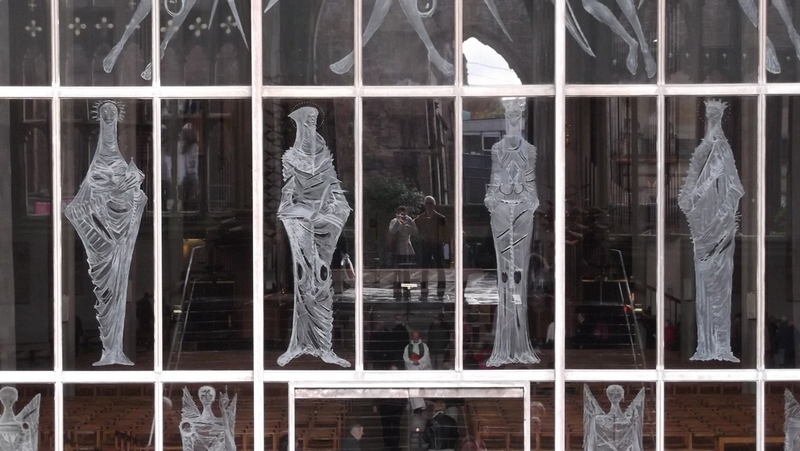 A few weeks back we took a tour round the more cultural parts of Coventry. Some might say that’s a rather short tour – the city comes in for a lot of criticism for being dull and badly planned – but once you walk a short way from the inevitable mall that covers most of the centre you find a much more gracious area. This is where the cathedral meets the university, a pleasant pedestrian area popular with visiting tourists. 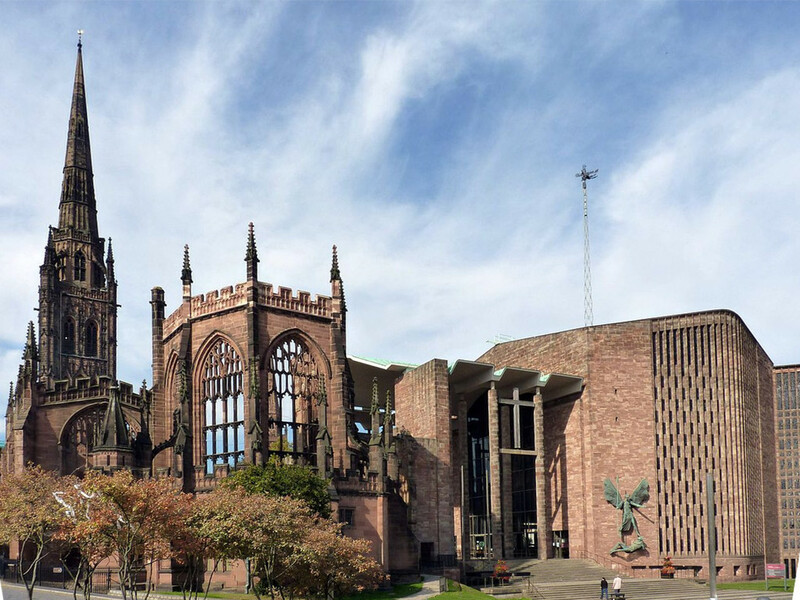 At the centre of old Coventry you can see the remains of St Michael’s church, the proper name for the 14th century Gothic cathedral. Over the centuries it was gradually enhanced until its early 20th centry glory as one of the most magnificent of its kind in Britain. Then came World War II, and one infamous night in November 1940 when the Luftwaffe, acting in revenge from an Allied attack on Munich, dropped hundreds of tons of incendiary and high explosive bombs on the city in a ten-hour raid that killed hundreds. It also mostly destroyed the cathedral, leaving just the perimeter wall and the west tower. Despite the appalling damage, the good people of Coventry looked forward to reconciliation rather than revenge, and the city became the first to set up a twinning association, in this case with what was then known as Stalingrad (now Volgograd). 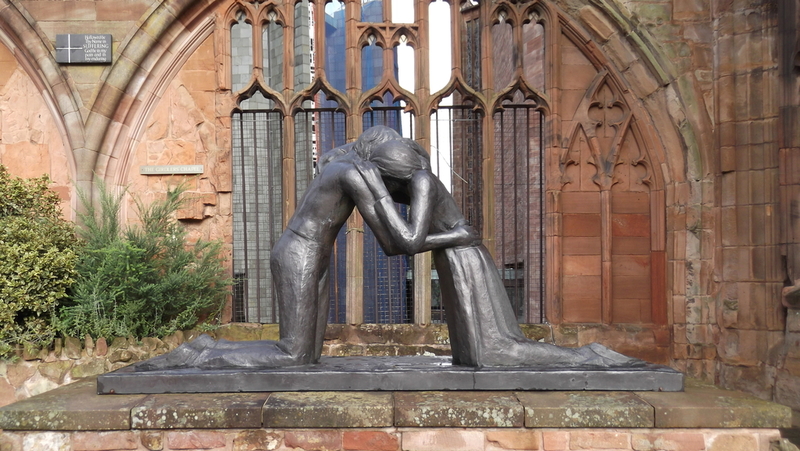 Coventry is now twinned with 26 cities, among them Dresden and Kiel (Germany), Belgrade (Serbia), Arnhem (Holland), Lidice (Czech Republic) and Jinan (China) and is a shining example of forgiveness. Also adjacent to the cathedral and university is the Herbert Gallery, a municipal art gallery of a somewhat eclectic nature, ranging from Old Masters to a Lady Godiva Room full of highly speculative stuff about the truth behind the legend. During the time we visited it was hosting an exhibition of cartoons by Quentin Blake (best known for being the illustrator for the late Roald Dahl) all of which had been commissioned by hospitals in Britain and France to provide pleasure for the patients. There’s also a Reconciliation Room that highlights the efforts made by the twinning association and others over the years and reminds visitors of the terrible events that link so many of the twinned cities together. So don’t be down on Coventry. It may be overshadowed by its far bigger and more dynamic neighbour, Birmingham, but it’s worth a visit.